In ares where urban development is on the up, the thought of excessive noise pollution around your property may seem like a cause for concern. But, in reality, there is no need for sleepless nights. If you find yourself living nearby an upcoming project, there are sure to have been some major steps taken to protect the visual and audible impact on the surrounding residential areas. Thanks to the latest developments in acoustic barriers, development works near your home needn’t be the nightmare you’re imagining. So, how effective are noise barriers? And how exactly do they work? Here is all you need to know about the innovative ways these barriers have been created to ensure developments have minimal impact on the surrounding landscape. Where do you find noise barriers? Noise barriers are used to block unwanted sound waves. These are most commonly from development works, busy highways and other sources of noise pollution near residential areas. They provide protection by directing sound waves away from their surroundings. By forcing the waves up over a barrier they can’t travel directly from the source to a potential receiver. In its essence it’s a pretty simple idea that has saved thousands from the torment of unwanted noise and unnecessary stress. Take, for example, the M4 motorway in Windsor, Berkshire. The challenge of reducing noise pollution from one of the UK’s busiest highways was made easier thanks to the construction of a steep-sided embankment slope. The soil-reinforced bun installed there dramatically diminishes the sound waves travelling away from traffic towards local properties, allowing them to retain their market value. Thanks to innovations and developments in noise barriers, they are having less of a visual impact on the environment than ever before. Depending on their location and what suits the particular needs of the project, barriers can be surfaced with either stone or vegetation. 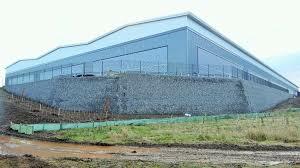 In fact, many noise barriers, especially those covered with turf don’t look like noise barriers at all. Why not take a look around your local area to see if you can spot key locations where they might have been installed? Motorways and around busy building sites are a good place to start. The effectiveness of a noise barrier is determined by the degree to which it forces the sound waves to bend away from the source. So long as the barrier interrupts the waves, the noise pollution will be reduced, however, the amount by which it is reduced is based on a variety of factors. The height of the barrier is pivotal, as is it’s location between the two points. To increase the noise-reducing effectiveness of a barrier, it’s much better to build it either close to the source or close to the receiver, baring in mind building closer to the source offers greater noise protection for all the surrounding areas. Strangely enough, barriers built mid way between source and receiver are the least effective at reducing unwanted noise. When it comes to the height of the barrier, the rule is – the higher the better. The barrier must at least block the line of sight between receiver and source in order to bend the sounds waves to a significant enough degree. The barrier must also lower sound transmission. The innovative composition of modern noise barriers are specifically designed to reduce the decibels that can penetrate through them adding an extra line of defence against noise pollution.